Former U.S. Rep. Artur Davis speaks during the Republican National Convention at the Tampa Bay Times Forum on Aug. 28. 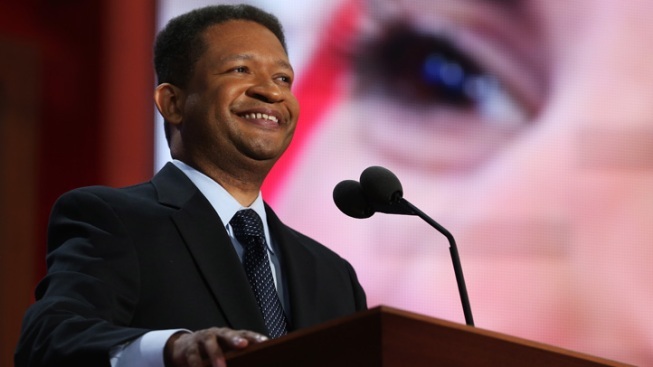 Republicans across the nation and in the D.C. region are keeping an eye on former Alabama Rep. Artur Davis, who is rumored to be exploring a run for a U.S. House seat in northern Virginia. Davis has now achieved rock star status at the convention. Just four years ago, the former Democrat was an early supporter of then-Sen. Barack Obama and gave a speech hailing him at the Denver Democratic National Convention. Now, Davis is one of the president's biggest critics. "We were all starry-eyed, but look at what a failure the president is," Davis said during his speech at the RNC Tuesday night. Needless to say, Republicans loved the message. After a failed gubernatorial bid in Alabama, Davis moved to northern Virginia and is said to be exploring a bid against incumbent Rep. Gerry Connolly (D). Davis is good for the party, according to RNC delegate Howie Lind from McLean, Va.
"I think he could be a good figure for us into the future," Lind said. Virginia Republicans haven't been able to knock out Connolly, even though they took three Democratic seats in 2010. Now, many in the party see Davis as the best bet for getting more Republicans in the U.S. House. Delegate Scott Lingamfelter badly wants a GOP win in northern Virginia. But as for Davis' chances of defeating Connolly? All he has to say is "good luck." Even with the recognition that Davis has a tough road ahead in Virginia Republican politics, he is exciting Republicans across the U.S., and many are glad he's now calling Virginia home.